There are a lot of things to love about summer, but too much sun is not one of them! When the heat outside becomes unbearable, stay cool and comfortable inside your Perth home in the comfort of a high-quality air-conditioning system from leading heating and air-conditioning specialist Hearth House. Evaporative Cooling is very popular in Perth as it suits the hot summer climate just right. On the super hot days, Perth will often have an easterly breeze and low humidity, this is absolutely perfect for Evaporative Cooling to perform at its peak. We have your cooling needs covered in more ways than one. We have a variety of air-conditioning systems designed to address the specific needs of our customers in Perth and throughout Western Australia, taking into account variances in lifestyle, housing type and weather conditions. Whether you need air-conditioning through the year or for select seasons, come to us at Hearth House and we will assist you to select the most appropriate, and cost effective air-conditioning system for you. The air inside your home is not recycled, allowing you and your family to enjoy fresh air, every day. CoolBreeze evaporative air-conditioning systems are perfect for locations with very low humidity. All CoolBreeze systems are manufactured right here in Perth, Australia. 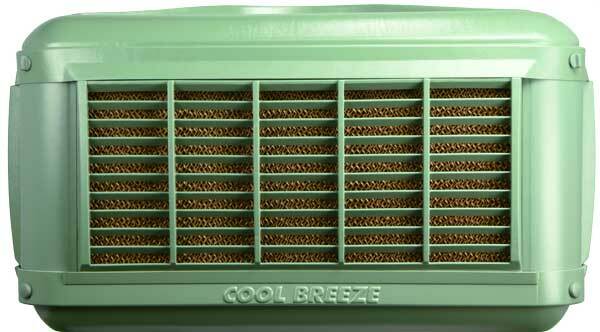 CoolBreeze Air Conditioners are unique in the way that water is held in Coolcel filter pads so the process also removes dust, pollen and allergens. CoolBreeze units replace indoor air around 35 times per hour, whereas refrigerated air-conditioners repeatedly recycle the same air over and over. Check out the CoolBreeze Brochure to find out more. You can make your Perth home as comfortable as possible with a single unit. Once ducted, you have an energy-efficient system that cools or warms your entire home. Panasonic leads the way in energy efficiency by using highly efficient R410A refrigerant, a DC Inverter compressor and DC fan motor which helps in giving you substantial energy savings, benefiting both the environment and your wallet. Panasonic Air Conditioners are known as being one of the quietest performing Refrigerated Air Conditioning systems available today. All Panasonic Refrigerated Air Conditioning Systems have specially built in and extremely unique technology that can sense cold air moving through the ducts during Winter. These sensors will tell the system not to let any air through the ducts until it has been warmed. LG’s Ducted Refrigerated Air Conditioners are renowned as being one of the most energy efficient units available today, their inverters have been at the forefront of Refrigerated Air Conditioner technology for quite some time. The zoning ability and control options of LG units are one of the main reasons for the popularity of their products. Their controls are extremely user friendly and allow the user to customise many aspects of the heating and cooling that you typically cannot do with most other brands. LG have also recently released a mobile phone application that allows you to control your homes heating and air conditioning via the app, all you need is an internet connection. Daikin uses intelligent inverter technology that adjusts the power output to an optimal level for your use. By using high power permanent magnets, Daikin systems can offer substantially higher motor and power efficiency than other Refrigerated Air Conditioners. Daikin has a range of innovative controllers available including: the SkyZone Controller, Nav Ease Controller and Zone Controller, each with their own unique benefits and technological advantages. Daikin also offers a mobile phone application that allows you to control your entire home’s temperature via your phone. Come and visit us at any of our Hearth House stores or contact us today for more information about the products we offer.